SSC is conducting the re-examination for Multi-Task Staff recruitment since 21 September 2017. The re-examination will continue till October 31, 2017. The examination, like every other year, had 25 questions from each of four sections- Reasoning, Numerical Aptitude, General English and General Awareness. For answering these 100 questions, the time allowed is 90 minutes for general candidates. For only the visually challenged candidates, examination duration is 120 minutes. Let us make a difficulty level analysis of SSC MTS re-examination held on September 21, 2017. 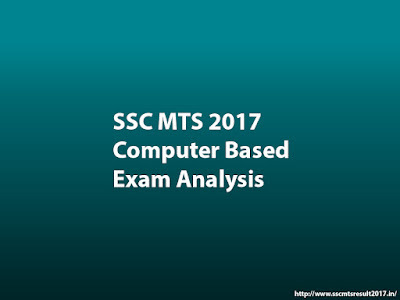 Here is a difficulty level analysis made on the questions asked for SSC MTS 2017 re-examination. The questions asked from this section is of moderate level. Two questions relating to bar graph data were asked. Similarly, two questions each related to topics Time and Work, Percentages, Simple Interest and Compound Interest, Average and Partnership were asked for the re-examination. 2-5 questions each from the sections Mensuration, Speed Distance & Time, Profit & Loses were asked. Apart from the above-mentioned questions, questions were also asked from Tenth Class level Trigonometry, Geometry, Statistics and Algebra sections. Solving about 15-17 questions can be considered as a good attempt. Error Detection and Sentence Improvement. The attempt of 15-17 questions may be considered as a good attempt. Questions from Current Affairs, General Science and History, dominated this section. The difficulty level of this section according to the experts, is moderate. A candidate who solved 14-16 questions can call it a good attempt. This section had questions mostly from section Miscellaneous and Analogy. The difficulty level of this part was easy to moderate. Questions from topics Syllogism, Calendar, Series, Cube, Coding-Decoding, Missing Term, Odd one out, Embedded figure, Direction related Questions, Matrix were asked. Out of asked 25 questions, an attempt of 18-20, can be considered as a good attempt. Now you can wait for the results in the coming months. Get more details about SSC MTS result updates 2017 here. * UNICEF or UNESCO ‘s Peace Award winner? * Author of God’s of Antarctica? * How to identify Atomic Number? * Indus water treaty is between India and? * Author of God of small things? * 2016 kabaddi WC winner? * Bengal was divided under which viceroy? * How many countries are members of Mekong Ganga? * Types of PM Mudra Yojana? * Lothal is related to? * Who invented the radio? * Lok Sabha lifetime achievement award winner? * Panchasheel agreement between which countries? * My music my life is the autobiography of? * No of fundamental rights in the Indian constitution? * Purna Swaraj statement was given by? * Winner of 2017 ICC champions trophy? * How many planets Solar system? * With which state Pakistan does not share its boundary? * Full form of GDP? 1. What is the HCF of 3/4 and 12/13? 2. 0.6 c.p=0.8 s.p, What will be the profit? You can check SSC MTS Tier 1 all regions results here. More questions updated in the coming days. Stay tuned here.